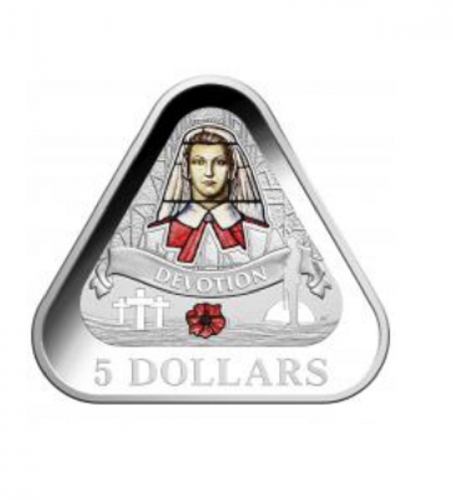 IT’S International Nurses Day tomorrow, held every year on May 12, and the Royal Australian Mint has marked the occasion with special release of a triangular commemorative collectible silver coin called “Front Lines Angels”. The image on the face of the coin shows one of the stained glass artworks at the Australian War Memorial, originally designed by Napier Waller, a Victorian artist who lost his right arm during that WWI. Mint CEO Ross MacDiarmid said that while this coin was focused on the critical role nurses have played in Australian military history, the Mint wants to highlight the contributions that all nurses make. “As we continue to commemorate the Anzac Centenary… we thought it important to look beyond the battlefields and recognise those that played an important role in caring for the sick and wounded during those times,” said Mr MacDiarmid, who plans to attend an International Nurses Day breakfast at the Australian College of Nursing on Friday morning. He said he believed the release of the coin would also allow the Mint to share a broader message reminding everyone of “the work that nurses do all around the world with such courage and dedication”. This will be the fourth triangular coin to be released in the Official Anzac Centenary Coin Program. The Mint will also be donating two coins to be awarded this evening at the ACT Nursing and Midwifery Excellence Awards in recognition of outstanding efforts. The theme for this year’s International Nurses Day will be “Nurses: A Voice to Lead, Achieving the Sustainable Development Goals”. Retailing for $90 each, the 2017 $5 Coloured Fine Silver Proof Triangular Coin – “Front Lines Angels,” can be purchased at eshop.ramint.gov.au/Front-Line-Angels/210555.aspx or by phoning 1300 652 020.